Celebrating the lifetime achievements of Sir Chris Bonington, Britain’s foremost climber and mountaineer. For the best part of thirty years from the 1960s Chris led the British climbing scene with some of the most ambitious expeditions mounted in the era. These are shown here in their international context while retaining their rightful beginnings in Britain. Chris made his home in Cumbria forty years ago and has played a major role in many aspects of Lake District life. Born in Hampstead in 1934, Chris grew up under the shadow of the Second World War and in an all female environment. Chris’ mother, Helen Bonington, and his grandmother, were the stalwarts of his early life and protected him physically and emotionally during the Blitz. His desire for adventure began early on with a trip to Dublin when he climbed his first peak, The Little Sugar Loaf (335m), in 1951. In the mid-1950s climbing equipment was not so different from what had been used a century earlier in the Alps. Ropes were made of hemp. Most climbers still wore hobnail boots, harnesses were a decade away and flat caps rather than helmets were the norm. Change was about to come. By 1959 Chris and other climbers had graduated from tight gym shoes for rock-climbing to ‘PAs’, the forerunner of the modern rock boot. Still unsure of what career path to follow after school, Chris chose to do his national service and opted for the Royal Air Force in the hope he could move into mountain rescue. He took up the offer of a commission but soon switched to officer training for the army at Sandhurst. During this time he started putting up new routes in Britain and especially the Avon Gorge near Bristol where he opened up the big Main Wall with routes called Macavity 1955 and Malbogies 1957. Three years in the Royal Tank Regiment in Germany and two years at the Army Outward Bound School were the backdrop to the start of his Alpine climbing. 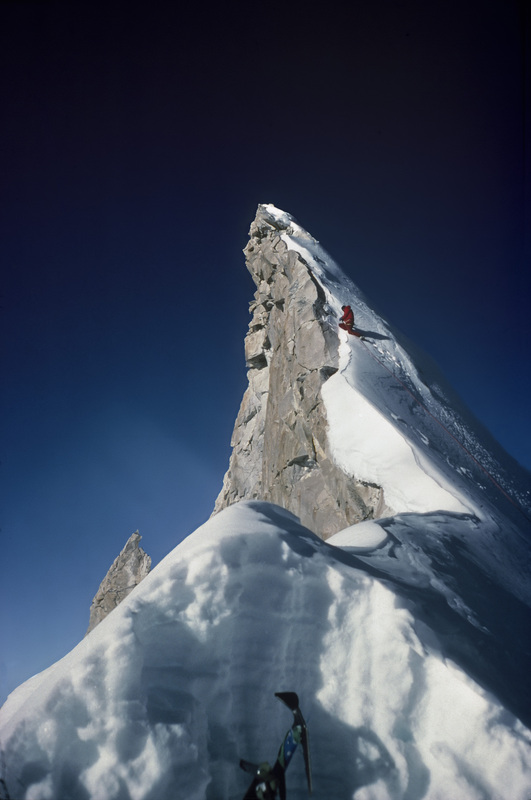 In 1957 the legendary Scottish climber, Hamish MacInnes, suggested attempting the North Face of the Eiger. Chris wrote: ‘I was desperate enough to agree. I thought: this would be a good start to my Alpine career.’ Chris had not yet been to the Alps and this first attempt did not get far. 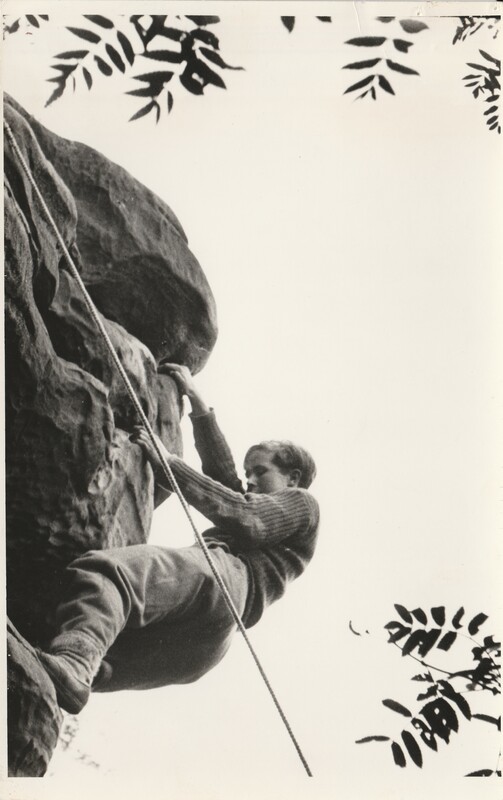 By the mid-1950s Joe Brown and Don Whillans, representing a new breed of post-war climbers from working class backgrounds, had become associated with the cutting edge of British rock climbing. Joe Brown climbed a number of legendary new routes in Snowdonia and the Peak District. In 1958 Chris Bonington, Don Whillans, Ian Clough and Hamish MacInnes completed the first British ascent of the South West Pillar of the Dru above Chamonix in the French Alps. 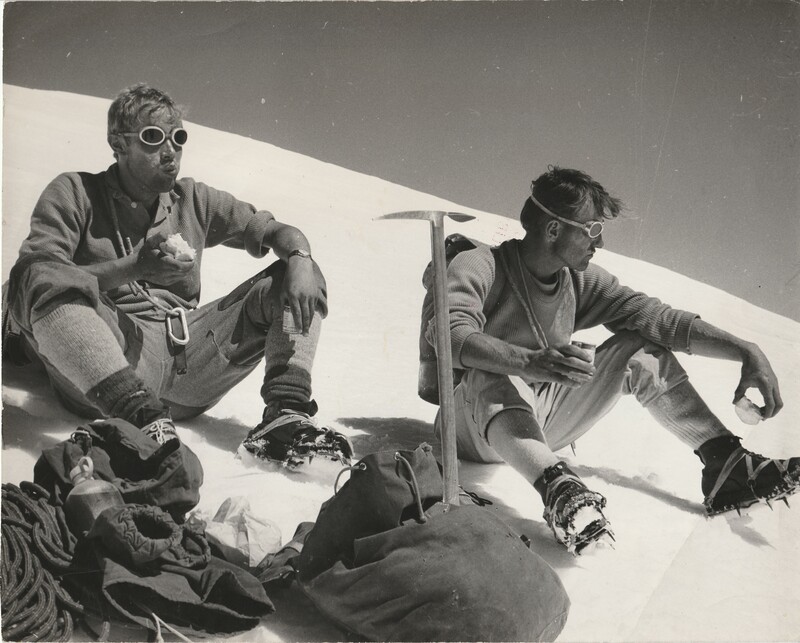 In early 1960 Chris was part of the successful joint-services expedition to Annapurna II (7,937m). A year later he joined Don Whillans and, having had no luck on the Eiger, they went to Chamonix to make the first ascent of the Central Pillar of Freney with Ian Clough and Jan Djuglosz from Poland. 1962 was the year that changed Chris Bonington’s life. Far away, in the world of newspapers, a celebrity had appeared. From then onwards Chris Bonington devoted his career to climbing and the press to following it. Public recognition came with a popular televised broadcast of the ascent of the Old Man of Hoy, one of the tallest sea stacks in Britain off the Orkney Islands, with Tom Patey, shown on the BBC in 1967.Chris’s career as a photo-journalist blossomed in early 1966 with his first assignment with the Daily Telegraph Magazine to cover an attempt to make the first ascent of a direct route up the North Wall of the Eiger by John Harlin, Dougal Haston and Layton Kor. Chris, alternating between climber and photographer, led an 80ft ice-pitch which he still considers the most extreme of his career. The climb ended in tragedy when a fixed rope snapped and Harlin was killed. Haston made it to the summit with a group of Germans attempting the same climb. Chris’ journalistic career reached a climax in 1968. He accompanied an Army Expedition in their first descent of the Blue Nile from Lake Tana in Ethiopia to the Sudanese frontier, which included travelling in a small boat down a fast moving river and avoiding crocodiles. Planning for a siege style attempt on the South West Face of Everest in 1975 was the largest logistical exercise Chris Bonington ever carried out. Barclays Bank underwrote the expedition and Chris then got support in kind of gear, food and travel costs. Improvements in equipment included better quality climbing ropes, metal shaft ice axes, high altitude double boots, fleeces, down suits and lightweight Karrimor climbing rucksacks which had all been developed over preceding years, often in association with leading-edge climbers. This tradition of climbers developing kit and clothing continues today. After five years of planning and executing large scale expeditions Chris scaled back, planning ambitious climbs but with smaller teams. His and Doug Scott’s first ascent of the Ogre (7,284m), a steep granite tower in the Karakoram range in Pakistan, in 1977 which included an epic six day descent. An attempt in 1978 to ascend the unclimbed West Ridge of K2 (8,760m), the world’s second highest peak, also in Pakistan, which resulted in the tragic death of one of Chris’s closest friends, Nick Estcourt. An attempt to climb the North East Ridge of Everest without oxygen in 1982, culminating in the loss of Pete Boardman and Joe Tasker. In 1983 Chris made the first ascent of the West Summit of Shivling (6,501m) in the Garhwal Himalaya in India with fellow Cumbrian, Jim Fotheringham. Finally, a personal lifetime’s ambition was fulfilled in 1985 when Chris reached the summit of Everest in the company of a Norwegian Expedition. This was the only ascent of all his climbs in the Himalaya which was not a first ascent. In 1990 Chris joined forces with the sailor, Robin Knox-Johnston. Jim Lowther, an experienced climber and Greenland explorer, joined them on an expedition to Greenland to give Chris and Jim the experience of sailing and Robin that of climbing. They sailed from Whitehaven in Suhaili, the yacht in which Knox-Johnston had made the first non-stop, single-handed circumnavigation of the world, to the East Coast of Greenland which is guarded by dense pack ice. They then skied, pulling pulks (a type of small toboggan), to the foot of the unclimbed, 2,660 metre Cathedral peak, in the remote Lemon Bjerge range, but did not succeed in climbing it. Sir Chris Bonington has been one of mountaineering’s greatest contemporary communicators and his extensive books have been accompanied by lectures, photography and journalism throughout his career. As a school boy it was a book of Scottish mountain photography that first sparked his imagination and this has gone on to fuel a lifetime of passion for both the written word and the photograph. Lectures, photography, journalism and books have all followed on from expeditions. The power to communicate clearly and with intelligence is an art that has won him great admiration and it is a legacy that can enrich the life of everyone, climber or non-climber. Education is at the core of much of Chris’s work in more recent years, formally and informally. In 1983 he helped to establish the annual Boardman Tasker Award for Mountain Literature. This prize is awarded for ‘an original work which has made an outstanding contribution to mountain literature’ in celebration of the lives of his two climbing friends and outstanding writers, Peter Boardman and Joe Tasker. The Boardman Tasker Award has been won by authors such as Jim Perrin, Joe Simpson, Peter Gillman and Bernadette MacDonald. We return from far flung corners of the world to Cumbria where Chris and Wendy Bonington brought up their family. It is in Cumbria that most of Chris’ major expeditions were planned and it is to Cumbria that he returned after triumphs and tragedies. If the fells offered him a sense of place then the history of this region gave him inspiration to embed himself in its legacy. Chris is Vice-President of the Friends of the Lake District and an honorary life Vice-President of the Campaign for National Parks. Further afield he is involved in charities that support some of the least fortunate members of society including LEPRA Health in Action, of which he is President and Community Action Nepal, of which he is Patron, which focuses on long term projects for health, sanitation and education. In 1996 Chris was knighted for his services to sport and in acknowledgement of everything he had given back to the environment that had nurtured his career. There is something in all of us that appreciates the sentiments of Ruskin. The mountains of the Lake District have long been a subject for painters and writers. Thousands have chosen the Lakes as their home over the past few centuries. Ruskin was been profoundly influenced by the Lakeland poets William Wordsworth, Samuel Coleridge and Robert Southey, sharing their conviction in man's potential nobility to be found through a love and reverence for nature.